George D. Ritchie was a long time (and outstanding) Wethersfield High School soccer coach and is a member of the National Soccer Coaches Athletic Association Hall of Fame. Charter Member NSCAA. Chairman of first Officials Committee 1941. 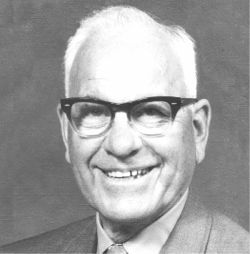 NSCAA Honor Award recipient 1950 - first high school coach to receive the award. Ritchie won seven soccer and six baseball championships in the Central Valley League. In soccer, for 18 of 19 years his team finished first or second in the league. In NSCAA he was at various times vice-president, secretary/treasurer, and committee member for Annual Meeting, Executive, Officials, Clinics, Rules, Awards for Secondary Schools, Honor Award, and Finance. His coaching philosophy was summed up as: It is better to build boys than to mend men. Coach and school administrator, Wethersfield High School, Conn.
1927 Varsity soccer coach at Wethersfield High School where his teams finished first or second 18 times out of 20 seasons (131-40-40 overall record); also a very successful basketball and baseball coach. 1969 Following his retirement from education which spanned parts of five decades, remained active as Connecticut IAC tournament director for many years. Central Connecticut Soccer Officials Association and Connecticut (Boys) Soccer Coaches Association annually present the George D. Ritchie Sportsmanship Award. The Wethersfield Connecticut Youth League is known as the George D. Ritchie Soccer Club. National Soccer Coaches Athletic Association Hall of Fame. Outstanding High School Soccer Coach. Connecticut Sports Writers' Alliance Gold Key Award.